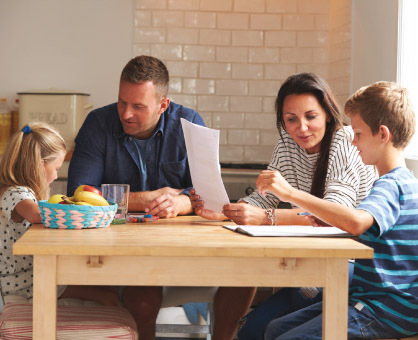 1) Have Family Meetings Who’s going where, how chores get done, whether or not to get a porch swing – there are all kind of decisions or coordinating tasks that might benefit from family input, updates, and planning. Family meetings allow structured space to get things done in a way that keeps all members involved and prevents issues like why the dog hasn’t been walked in a week from becoming an argument that pops up regularly instead of a concern voiced once and addressed. Meetings also save time when the week is underway and it’s more difficult to fully listen and respond to each other. Kids can practice problem solving during the meetings – but they shouldn’t be all business either. Start with a joke, a check-in from each family member, or “thank yous” to other members for something that helped someone else. Keep them short and sweet and finish with a personal goal or thing each member is looking forward to in the coming week. The screens of our lives are major barriers to looking up and interacting with the people around us. All of us occasionally need help remembering that checking Facebook or work email is not something we are going to wish we’d done more of on our death bed. Many of us say we need to spend less time with screens, but unless we have a guideline in place, we unthinkingly default to a quick scroll-through or jump up with every ding of a text arrival. Having a screen-ban will mean different things to different families – some may start with a couple hour weekend bans, while some will get in a good ban every day – but it’s important to have something in place that’s well implemented. It may not mean that suddenly everyone’s talking deeply with each other, but as long as the temptation of screens is nearby true interaction is significantly less likely. Improve your odds. And if it’s not true interaction that happens, there might be other crazy results like book-reading and walk-taking, or even just the novelty of genuine “boredom,” a teachable phenomena that frequently leads to the wonderful ability to find things to do. Healthy families respect the things that keep individuals healthy, and for parents that includes some measure of time alone or with other grown-ups. Going on dates, dad’s book club, mom’s Thursday afternoon closed-door meditation, or whatever – parents who model self-care are showing their children how to take care of themselves so they can be there for others. Giving up your yoga class because you have to be with your family is not a worthwhile sacrifice if you lose sight of your own interests or are just cranky during “quality family time” because your back is tight and you’re feeling the creeping resentment of martyrdom. Teach your kids that when everyone has some time to do what makes them feel healthy and relaxed individuals and families are both better off.